Каталог » Полезно знать » Удивительная история.. 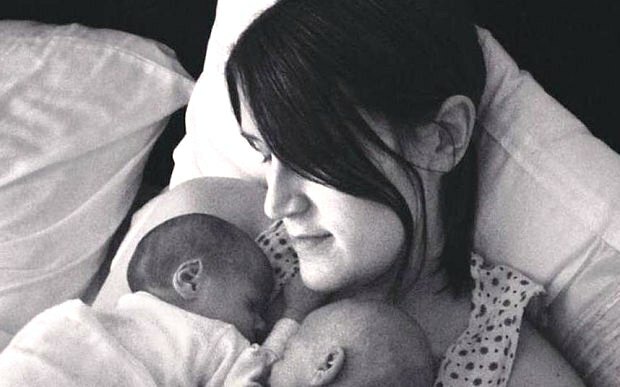 But nine years on she has given birth to the twins after IVF treatment using an egg donor. Ms Haynes and her husband Sam, both 28, are said to be overjoyed. She said she had no idea she was different when she was growing up but began to grow concerned when she had not started her periods by the age of 19, despite going through other signs of puberty. Following months of hospital trips and blood tests, specialists told her she had been born with XY chromosomes, meaning she was genetically male. She had no reproductive organs thanks to a condition called androgen insensitivity syndrome. She confided in her friend Sam, with whom she had been close since the age of 16 and who comforted her throughout her ordeal and later became her boyfriend then husband. The first signs of hope that Mrs Hayne’s condition might be curable came in 2007 when a new specialist at Royal Derby Hospital found a tiny womb missed on previous scans. Mrs Haynes was given a course of hormone tablets to give her the right levels of progesterone and oestrogen in order to create an environment where her womb could grow and stop her suffering osteoporosis. However the couple, determined not to give up, paid £10,500 – more than half their savings – for IVF treatment at a clinic in Cyprus last April. Mrs Haynes said: “I was so nervous. We only had one shot and couldn’t afford to go through it all again. I desperately wanted to be a mother and knew if there were no viable eggs or the implantation wasn’t successful I’d be distraught. Doctors told the couple there was a 60 per cent chance Mrs Haynes would get pregnant and she should wait two weeks before taking a test, although – overcome by excitement – she took one after 10 days. When Mrs Haynes went for her six-week scan she was shocked to discover both eggs had taken and she was expecting non-identical twins. “I couldn’t believe it. I freaked out, but I was over the moon at the same time. I had the chance to have a complete family,” she said. The pregnancy went well and in December her doctors decided to induce her two weeks early. She gave birth naturally to on Christmas Eve to Avery, at 5lbs 3oz, and Darcey, 4lbs 6oz. Speaking publicly about the births for the first tine Mrs Haynes said: “Becoming a mother was the single most amazing moment of my life. When I held the babies in my arms for the first time I was overwhelmed. I had spent nine years coming to terms with the fact this might never happen, but in that moment all the pain just washed away. Dr Geetha Venkat, of Harley Street Fertility Clinic, London, described the case as “amazing”.